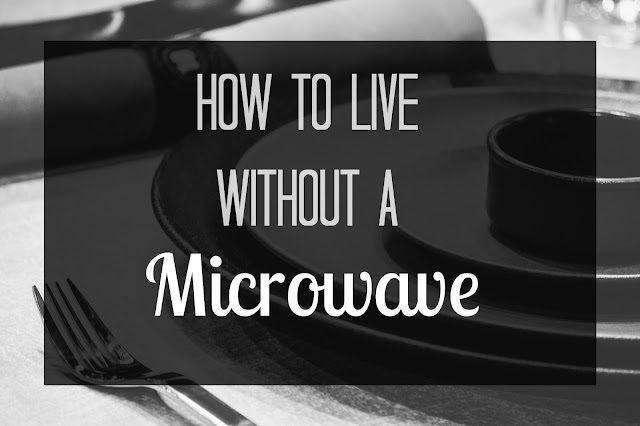 There are multiple reasons for not owning a microwave, not the least of which are health concerns, lack of space, and right-leaning political affiliations. I'm not going to tell you that you shouldn't have one in your home, but I am going to tell you how to go without one, should you so desire. A little background: In my life, I've made my fair share of food in a microwave- frozen burritos, eggs, reheating food that should have never been cooked to begin with. When I started making healthier food choices, I found I used a microwave less. This gave way to adapting an all-around healthier lifestyle, raising concerns about the safety of microwaves. After becoming a mother, I all but stopped using a microwave. When it broke, it was an easy decision to not replace it. We've now been without a microwave going on six years. If you're looking to ditch yours, or use it less, I'm sharing what I've learned over the years to make it easier. So maybe you've been using a microwave because you developed the habit in college and continue to find it more convenient than your oven. Maybe you haven't turned on your oven because you have sweaters inside. Here's the thing: using your oven or stove isn't actually that inconvenient. Some things do take a bit longer to cook, yes, but I assure you, they taste so much better. The food is heated evenly throughout, so you won't burn your mouth on the third bite. I cook oatmeal every morning on the stove in the time it takes my kids to get dressed and sit down to the table. It takes very little effort to pour oatmeal and milk in a pan and turn on the burner, stirring occasionally. About the same effort it would take to pour it in a bowl, add milk, and push a button. And again, no one's burning their tongue halfway through their meal. I'm not saying you need to read the owner's manual, but it wouldn't hurt to test drive it a bit to see what you've been missing. It's common to cook one meal with the intention of eating it for dinner the first night, lunch the next day, and maybe one more dinner on leftover night. Soup reheats nicely on the stove. Put other dishes in the oven at a slightly lower temp than you cooked it at, or use the warming option if you have one. I like to use glass food storage containers in an effort to eliminate plastic, but they're especially great for being able to grab out of the fridge and put in the oven. For dishes with sauce, I save a little sauce separately and add it as needed to keep food from drying out. Eliminating your microwave might mean you need to check your portions. If you don't want to be bothered reheating food in your oven, simply cook less to begin with. On the other hand, it might be beneficial to double your recipe and freeze it so you have something to pop in the oven later, saving prep time. Figure out what works for your schedule and lifestyle. I mean, unless your sole reason for pulling the literal plug is a matter of privacy and you aren't keen on aluminum foil headwear, health might factor into your decision just a little bit. Look up a few simple recipes and stock up on healthier food. You'll be surprised at how quickly you lose the desire to nuke a frozen burrito. The oven is my go-to, simply because I don't like having a lot of appliances, but it isn't your only option. Toaster ovens are great at cooking and reheating food. You might try cooking more meals in a slow cooker. Or, you might find that rather than replace your microwave, you prefer food that doesn't need much heating to begin with.